Replacing Bellerin, yet more transfers, and another goalkeeper. First an apology for the delay in publishing through yesterday and this morning. Like many blogs, we’re run by volunteers, and we simply ran out of people yesterday and this AM. Hopefully getting ourselves back together now. And so what did we miss – well obviously Bellerin. So now we have three players out for the rest of the season – one of whom (Danny Welbeck) is then out of contract so may well never return to the club. So who do we use now we have no Bellerin? Maitland-Niles looks much more assured and much more likely to be able to play in the sort of line up that the manager likes. Also if we want to hold onto him, and want to see just how good he can get, we need to be giving him games and now is the obvious time. Xhaka can play right back and although there are people who will knock Xhaka whatever he does, that whole thing seems to be just attacking a player for the sake of having someone to attack. Jenkinson has hardly been seen except in low level cup games, and that suggests to me that the manager really doesn’t see him as an option. But it might just be Jenkinson has been unfortunately down the order of things, and could now rise up. Denis Suarez has been tipped to be a player with us since before the start of time, or so it seems, and he could fit in quite readily I would have thought. But here is one other thought. Because of the way in which we all traditionally set out line ups, we always think of them as balanced with equal approaches happening on left and right. But that is not actually how the modern game is played. Quite often one side of the pitch does not equal and balance the other. So just because we have Kolasinac as a fast running marauding full back on one side it does not mean that we need the same on the other. We could play a system in which when Kolasinac moves forward the back three central defenders shift across a little to cover and a right footed defender slots in as the fourth man in a more conventional back four. That could mean Monreal playing part of a back three, but the when Kolasinac moves forward Monreal moves across to left back while a defensive midfielder drops back to make it a back four. Thus on the left we are playing a back three plus wing back moving to back four, when the wing back attacks. On the right we are playing a back three and ahead of them a right back who drops back when the left attacking wing back moves forward. In short left and right are working in harmony with each other, but not as a mirror image. Meanwhile there is the ever growing transfer news and a lot at the moment about Kevin-Prince Boateng from Sassuolo, from Italy’s top division. He’s a midfielder and ready to move, so we are told. But we are often told these things and it would seem unlikely the Sassuolo would agree to their player coming to Arsenal on a loan deal. What’s in it for them? Sassuolo are 12th in the Italian League and not threatened by relegation, so maybe they would want to do a deal if they are in financial trouble. But that still requires Arsenal to have the money. Meanwhile that old man of dubious activities The Very Large Sam Allerdyce has claimed that he tried to sign Aubameyang for Everton, and one has to wonder quite what the old (alleged) con-artist is up to these days. Making a crust of bread with past fantasies? It’s one way to survive. Or maybe he’s looking for a job, and is saying, “this is what you could get with me.” The trouble is thought that most of us already know what is to be got out of the Big One. But in case you wanted one more Arsenal transfer try this from the Metro. We are looking to sign Juventus goalkeeper Emil Audero who is currently on loan at Sampdoria. Remember that although Cech will go at the end of the season, we will still have three goalkeepers in the squad, with Ospina on loan. We might also need plans as to what we are going to do with all of these first, before sign any more. 7 comments to Replacing Bellerin, yet more transfers, and another goalkeeper. It’s unfortunate to learn Bellerin is out for the season for Arsenal with a serious knee injury. Only God knows how the knee injury he sustained in our last home match against Chelsea in the PL last Saturday happened to become an ACL. For, I watched him stressed his legs beside a Chelsea player probably attempting to nutmeg him to rid him of the ball but fell down in the process only to have a long treatment on the field and stretchered off. The reports in the media that I’ve read are suggesting that Arsenal will not during this ongoing January transfer widow rush to the market to sign a replacement for him because there are 5 Gunners in the first team squad who can play as right/wing back to cover for the R8 position during the absence of Bellerin. This is good news as far as I am concerned as a Gooner. But how will Arsenal fair to come top in the game to top Man Utd in the FA Cup match on Friday at the Ems now that that the Gunners have lost their 1st team choise game starter Bellerin to injury? I think Arsenal will cope with this latest lose at their right back position but if one of Elneny, Xhaka, Jenkinson, Lichtsteiner and AMN who Emery will start in the match step it up considerably to make playing in the position look as if it has all along been his own by having a great performance for Arsenal in the game that will influence a win for Arsenal in the match directly or indirectly. The general opinion in the Gooners sphere is AMN should be allowed by Emery to step in to the RB position. And if he doesn’t give any room for concern if he’s started at RB to play in the Man Utd FA Cup match, that will be great. But Emery doesn’t go by the popular opinion of the Gooners when it comes to to start a Gunner but goes on to start the Gunner he believes is the Gunner he should start or play in the match. So, I will not be surprised to see him start or play Elneny in the match at R8. Furthermore, I think Arsenal will start the FA Cup match against Man Utd by playing Emery’s preferred back three defense-line in the match in a Arsenal playing formation game start of: 3-6-1 to start the match. But later in the game could switch to a 4-3-3 formation and also could still switch to 4-4-2 or even switch to the Arsenal popular playing formation style of 4-2-3-1 as the match progresses. Nevertheless, the bottom line is, Arsenal MUST beat Man Utd in the FA Cup match on Friday night at the Ems to put an end to Ole Gunnar Stolksjear’s Man Utd coached team winning spree from getting to 8 on the run at the Ems but halted. Big Sam tried to sign Aubameyang so he could play right back, I’m sure. Maybe someone with number crunching background happens by? A couple of GameDays ago, I was playing with the league so far (as a 46 dimensional space). Principal Components Analysis (PCA) puts every dimension into every eigen vector, by trying Factor Analysis (FA) it tries to minimize what goes into each vector. Supposedly the optimal number of components was supposed to be around 6, but if you have poor data things don’t work that way. So, I went looking for more data (and I am still adding). I guess this is what data mining is about. But one of the things I did, was to randomly assign integers to teams and referees. For example, if I had 17 referees, I would assign a random number between 1 and 17 (without replacement, so no referee could get the same number as another referee). As this is a random assignment, one expects that in playing with the numbers, that most of the time there will be no correlation between what numbers were assigned to what referees, and anything having to do with how the league operates. If one is doing PCA, the variable associated with the name of the referee should always have a small “loading”. If one is doing FA, the referee name variable should never be something that gets included into any vector. If I try shuffling the name/integer assignment enough times, I may start to see that some particular assignment of referee names to numbers leads to the name of the referee becoming an important variable. Once one starts to see something like that, you can use a process which is smarter about finding the optimum assignment of integers to how the league standings are. As these integers for N referees are 1, 2, … N, it would essentially rank the referees according to how :twisted” Mike Riley wants the league to operate. A variation on this theme, could look to maximize “performance” of a team with respect to who the referee is. Referee “names” that occur at one end, could be suspected of “liking” a team, at the other end they could be suspected of hating a team. Probably also worth trying. But, if nobody seems interested in commenting on this, let alone participating, I will probably just look for the Arsenal likers and haters. 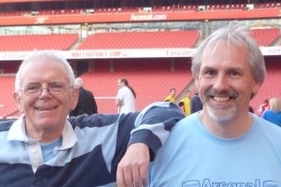 @ Gord – An Arsenal loving referee ? In the PIGMOB ? That in itself would render them most unsuitable to be a ‘ right and proper’ referee in the EPL ! I think that you should go with the (rightful)assumption that they are all Arsenal haters . It may not skewer your findings. Don’t we have to give them the benefit of the doubt Brickfields? But the process I envisage, can’t actually say that any of them love Arsenal. I would equally rank them by how much they love Arsenal, or by -1 times how much they hate Arsenal. Gord – sounds like a useful method of plotting a bias graph. Assigning alpha to each referee might be easier track. More interesting is it might even make type 3 manipulation more visible. Your treatments exercise has brought up a whole can of worms that might show further bias from individual officials and also as a collective, targetting particular clubs.